Bikes can be returned to other locations. Many hotels in the area offer this company's bikes for hire. 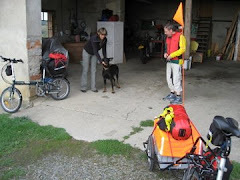 Many of the hire sites only have a few bicycles and so, it is necessary to book, at the latest, a few days in advance. For the busy periods, school holidays, public holidays and the like, for example, it is better to book as soon as you can. There are two sites in Edenkoben, one of which is the company's central warehouse. This is near to the railway station. Bike hire here is at the time of writing 10% cheaper than in the other locations. Need we say more? Information about rail travel in Germany can be found on http://www.bahn.co.uk and local public transport (bus, railway and ferries) in Rhineland Palatinate and Northern Baden-Württemberg can found on http://www.vrn.de. Prices are reasonable. There are serious discounts for multi day and for group hire. Touring bikes with 8 gear hub gears and a back pedal brake. Touring bikes with 24 gear derailleur gears. Premium touring bikes with 30 gear derailleur gears. Pedelecs (e-bikes). As long as all goes well we hope we can hire at least two of these bikes to follow the Rhineland Palatinate Route, mentioned last week. Trailers for drink crates, dogs and children. Not all at the same time. We have yet to hire from the company, but from our written contact it seems to be well organised. We will report after our trip later in the year.